TamperTell® security seals are a quick and easy way to secure your personal belongings and your peace of mind. Whether you are travelling, camping or simply leaving your luggage unattended; this popular product instantly informs you if your luggage has been tampered with. 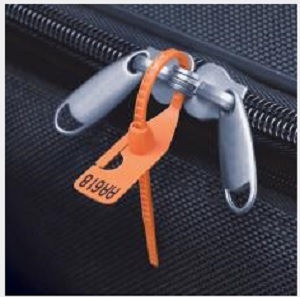 A great alternative to having 5 separate bulky padlocks on your luggage, the lightweight TamperTell easy seals made from strong, robust nylon are uniquely numbered. Generic padlocks can easily be swapped or jimmied open without your knowledge; with the TamperTell security seals you are instantly made aware if your luggage has been tampered with by seeing if the seal is broken or the number does not match your recorded number, and you are able to inform airport customs officials immediately. The bright orange TamperTell easy seals are a great visual theft deterrent and are easy to use: simply thread through your zipper “handles”, lock and pull to tighten. Just as easy to remove, simply pull the release tab and it will tear your Tamper Tell open – no scissors required! TamperTell security seals are a great way to secure your luggage as most padlocks are not allowed through airport security any more.